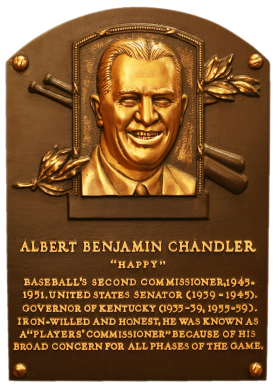 The former governor and U.S. senator from Kentucky, Chandler succeeded Judge Kenesaw Mountain Landis as the second Commissioner of baseball. 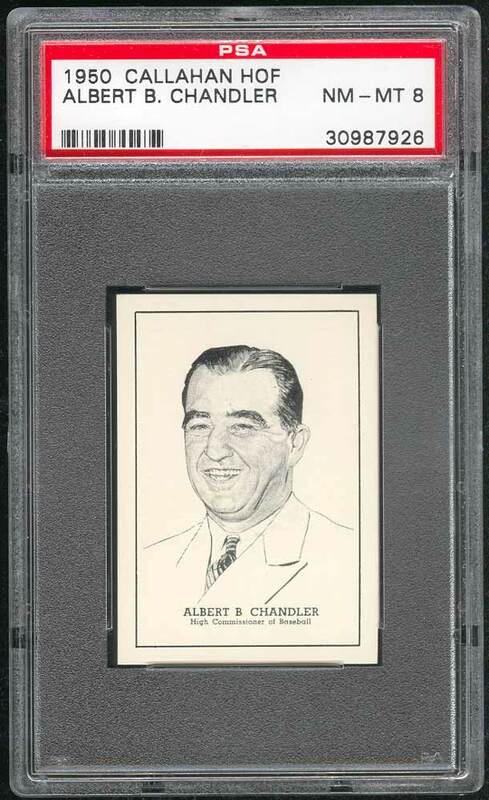 Despite the opposition of most baseball owners, Chandler backed Branch Rickey's signing of Jackie Robinson and prevented a player strike by threatening to ban any striking player for life. Preferring a "yes-man," the owners voted Chandler out in 1951. Comments: In July, 2004 I first picked up a GAI 6.5 example of this card at the National in Cleveland from dealer and hobby friend Dan McKee. 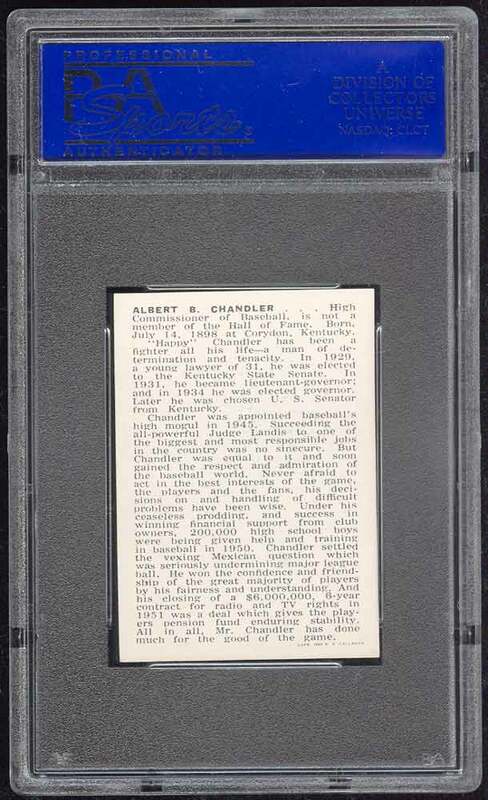 The card was eventually crossed over to a PSA 6. In February, 2005 I purchased this PSA 8 upgrade from a hobby friend - thanks Wayne. 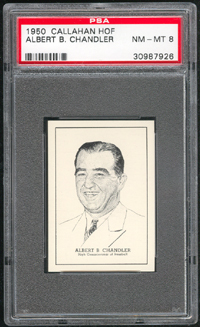 Description: These cards which feature artist Mario DeMarco's drawings of Hall of Famers, were produced from 1950 through 1956 and sold by the Baseball Hall of Fame in Cooperstown and at major league ballparks. The cards measure 1-3/4" X 2-1/2" and include a detailed player biography on the back. 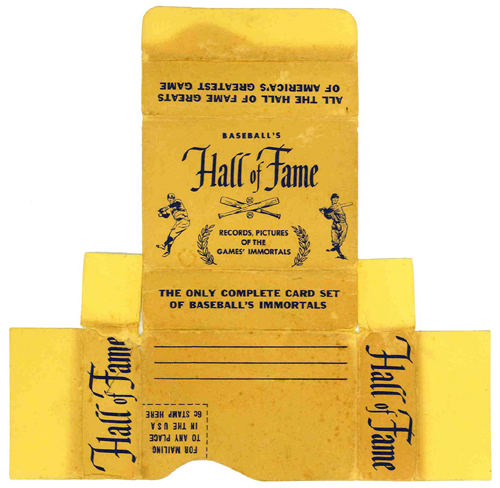 When introduced in 1950 the set included all members of the Hall of Fame up to that time, and then new cards were added each year as more players were elected. Therefore, cards of players appearing in all previous editions are more common than those players who appeared in just one or two years. When the set was discontinued in 1956 it consisted of 82 cards, which is now a complete set. B.E. 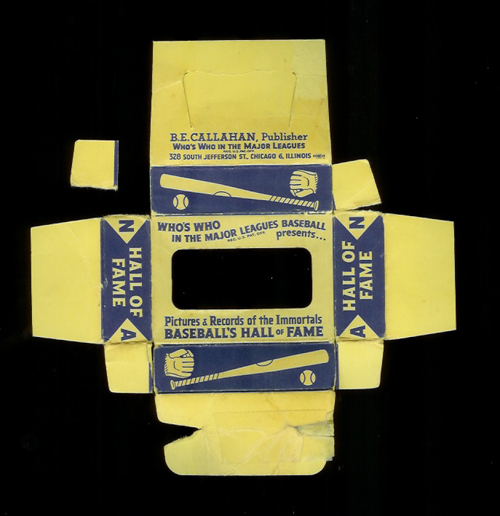 Callahan of Chicago, the publisher of "Who's Who in Baseball," produced the card set.